Our Acoustic Underlay range is engineered with technologically advanced systems to ensure you get the best possible soundproofing result. Whether you are looking for underlay for commercial or domestic applications our range of underlays ensures you have the right product for maximum impact . SP-MAT is an acoustic soundproof underlay. Specifically designed for the reduction of impact sound to suit both concrete and timber substrates. SP-MAT has been specifically engineered to meet the acoustical requirements of specifiers for all common construction and installation methods. For use in high-rise units, multi storey town houses and homes. SP-MAT Acoustic Underlay can be used in new and old buildings requiring impact sound insulation. And can be used for the installation of ceramic floors, timber, laminate, carpet, plank vinyl, and over Masonite. CSIRO (June 2016) tested and BCA compliant acoustic systems. It can be used in wet areas when installed in conjunction with WP-1 “The Pink One” or other ACT Australia approved Waterproofing Membranes. And can be applied and tiled over using ACT Australia Tile Adhesives ADH-33, ADH-44, ADH-55 & Prolite. 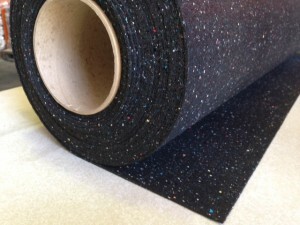 One roll of SP-MAT 5mm Acoustic Underlay will give you 12 square metres of coverage. Individual testing should be carried out to ensure SP-MAT meets the specific requirements of each job. Construction Configuration including concrete thickness, density, floor/ceiling configuration etc. will affect acoustic results.